Fruit of the Vine by Ellen Weisberg tells the story of Justin. Justin is a quiet, shy boy who is frequently targeted by his peers because of his looks and his sensitive personality. One night he wakes up to find himself not at home in his bed where he should be. 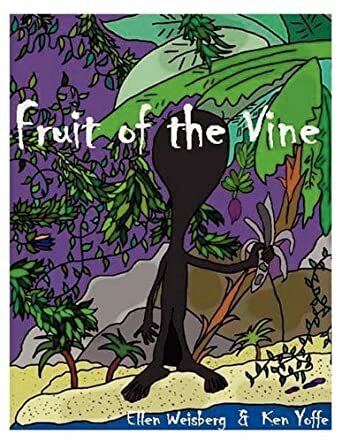 Justin appears to be on an island full of strange creatures and, despite desperately trying to get back home, he gets involved in helping Irvino. You see, Irvino is in the same situation that Justin is in, picked on and ostracized. Justin feels drawn to him, kindred spirits in very different worlds. By helping Irvino, Justin helps himself to recognise what true friendship is and to see that being different is never a bad thing. Fruit of the Vine by Ellen Weisberg is an amazing story. The subject of bullying is a highly emotive one these days; we live in a cruel world and it seems that children can be far more brutal than adults. Ellen tells us how one young boy changes from being a shy introvert to a more outgoing person through a dream. The book is exceedingly well written and easy to understand. I feel that it shouldn’t just be for children. This is a book that should be read by parents, children, and teachers alike. The illustrations add a great deal to this story and they tell their own story as well. I truly believe that there should be more books like this and that they should be made compulsory reading.